Living in Duluth , MN gives us little chance to see dark-eyed juncos, about our only chances at that are in the spring or fall during migration flights. The juncos are a most welcome sign to see after the snow has left as it is a sure sign of spring. 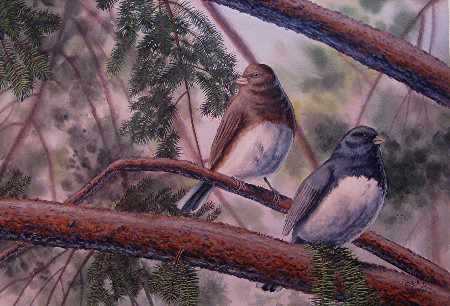 The darker male here and the brownish female are resting in a nearby spruce tree after ground feeding with competing pine siskins, white-throated sparrows, chipping sparrows and white-crowned sparrows. The juncos and the other ground feeding birds can number between 20-30 at a time and spend about three weeks in our yard. Then it’s departure for the Arctic in the spring or the Gulf of Mexico in the fall.